This important book on the culture of the potato presents scientific information for potato growers in an easily accessible format and clear language. Managing the Potato Production System contains all the information needed to harvest a bountiful crop. The book is written specifically for field production-oriented technicians and growers and makes the knowledge of production systems easy for readers to apply by providing essential background information, suggestions for incorporating the information into a total production system, and sample forms for collecting data to assist proper and timely decision making. Special sections on harvesting and storage emphasize techniques for protecting the quality of the crop while other chapters provide helpful information on reporting trends in marketing to aid future planning efforts. This easy-to-use guide directs producers to the most critical areas of production, storage, and marketing, helping them to control or influence factors that will result in a healthy, plentiful crop. This is a valuable reference to be consulted for solutions to specific problems or ways to take advantage of opportunities as they occur. 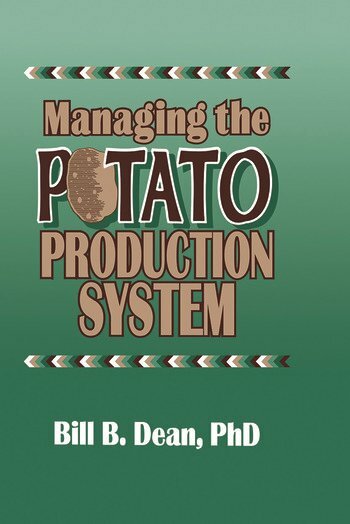 Managing the Potato Production System is more than abstract theory; the systems described here have been proven in one or more actual cases of potato production. The strategies devised in this volume help potato producers grow an economically viable crop in a manner that can be sustained over generations with positive impact on the environment. The book concentrates on the interpretation of scientific findings about potatoes and production beginning with a discussion of the origin of the crop, its distribution, and history of its production in the United States. Other chapters feature explanations of the factors which affect potato production including the genetics of Solanum tuberosum in regard to variety (cultivar) improvement and the effect of potato breeding on production. Because this book covers basic and specialized topics, it is a valuable introduction for beginning level college students and an excellent problem-solving guide for growers, consultants, field workers, and extension specialists.